This week The Broke and the Bookish is inviting everyone on a little book tour around the world to check out books that take place in places other than the United States. Here are ten I enjoyed that take place abroad. The Light Between Oceans by M.L. Stedman is soon to get the movie treatment and you can see why. It takes place mostly on a lighthouse off the coast of Australia, where the lighthouse keeper and his wife are the only inhabitants. It's a tear jerker but so good. What Alice Forgot by Liane Moriarty is a modern day read, that I hear rumblings of being made into a movie as well. Set in Sydney, Australia, it's premise is simple, Alice wonks her head at spin class and wakes up thinking she's still twenty-nine, deeply in love with her husband, and pregnant with their first child. When really she's thirty-nine and she's getting a divorce. What do you do when you wake up one day and realize you don't like the person you've become? The Bookman's Tale by Carlie Lovett takes place in Englad, and is a great read if you like Shakespeare history, book mysteries, secret passageways and family secrets. And, I totally wanted to move into the main characters nice little cottage! 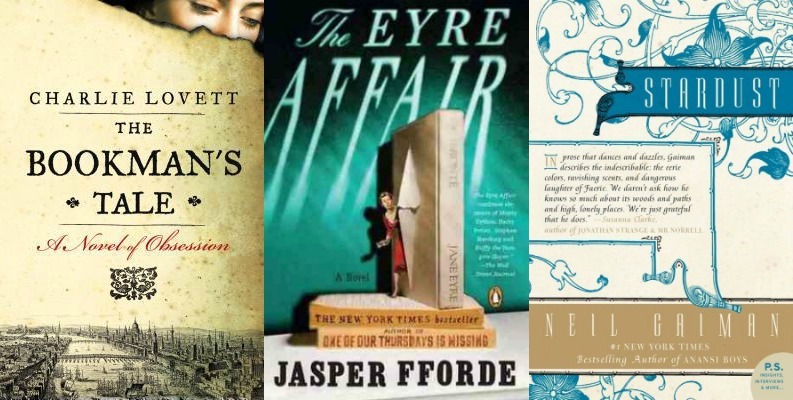 The Eyre Affair by Jasper Fforde is a great literary story set in an alternate England where dodos are still alive and where Jane Eyre goes to India to help her cousin St. John Rivers with his missionary work! Great if you love books and have a quirky sense of humor. Stardust by Neil Gaiman takes place in a fictional English town and also has as very strong fantasy land aspect to it. This is a great book for adults who still like fairy tales. 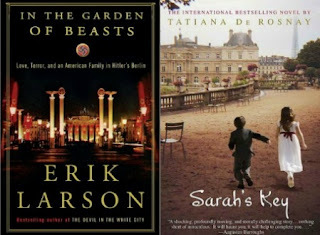 In the Garden of Beasts by Erik Larsen is the nonfiction account of the United States' Diplomat to Germany, Wlliam E. Dodd, and his family, living in Germany in the days leading up to World War I.
Sarah's Key by Tatiana De Rosnay takes place in France in the 1940s. It's a heartbreaker. I'm just warning you upfront. I didn't really know much about Vichy France prior to reading this book, and wasn't very impressed with it after finishing this book. Uprooted by Naomi Novik is a great fantasy romp. While I didn't seem to love it as much as the rest of the blogging world, I still thought it was very good. If you enjoy magic, medieval times, strong women characters, and fantasy in general, you'll probably enjoy Uprooted. 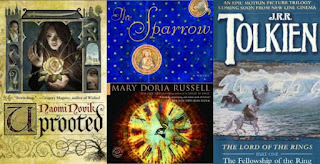 The Sparrow by Mary Doria Russell takes place in Italy, Puerto Rico, and Chicago, but most of the action happens on the planet of Rakhat. It's not a happy go luck book, but will definitely stick with you. What does it mean when you feel like you're destined to do something, so you do it, and it ends in the death of everyone you love? The Fellowship of the Ring by J.R.R. Tolkien set in the fictional land of Middle-earth. No other has made me ache to be able to write quite like Tolkien. He weaves these complex histories, cultures, and characters in a way that just immerses you in the action. So there you have it. 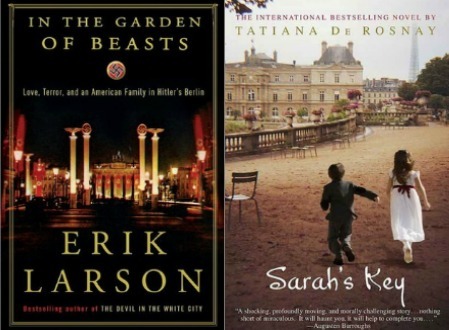 My ten picks for books that take place outside of the United States! Great Top Ten! I just finished Big Little Lies by Liane Moriarty. I need to check out her other books! I just found The Husband's Secret at the thrift shop this month and am really looking forward to reading it. 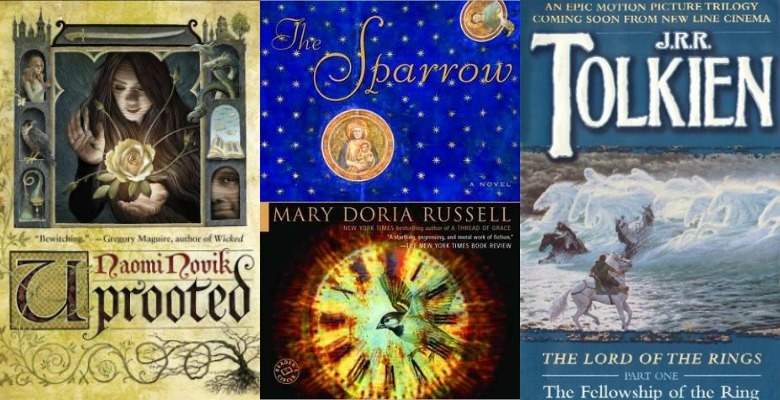 If you look at my post from this week, you'll see that England is my favorite book setting -- and all three of your England books look awesome! "The Eyre Affair" has been on my to-read list for ever and ever, but the other two look great too! 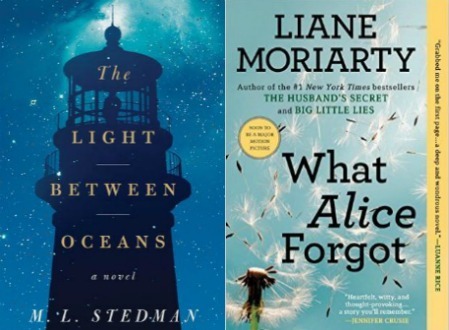 Both Liane Moriarty and "The Light Between Oceans" are on my list for Australia. I'm looking forward to the "The Light Between Oceans" movie! 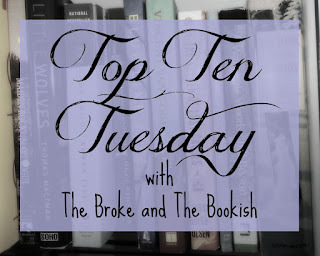 Lindsay, I stopped over to your blog and I can't believe how many of the same books we liked! Jasper Fforde is quirky and funny and I really recommend his Thursday Next books. They are just a nice fun read.